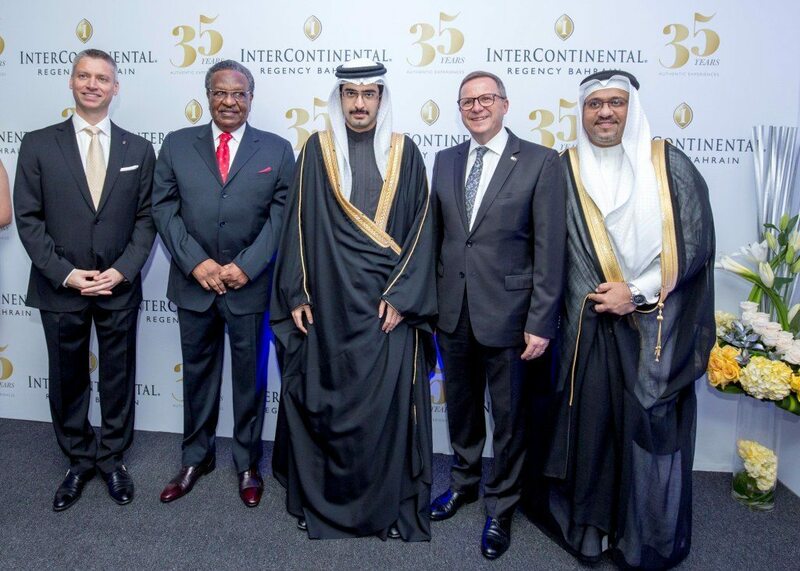 InterContinental Regency Bahrain, one of the leading five star hotels in the Kingdom, celebrated on Sunday, December 13th 2015, 35 years of establishment in the Kingdom of Bahrain in the presence of His Highness Shaikh Salman bin Khalifa Al Khalifa, Advisor to His Royal Highness, the Prime Minister, and His Highness Shaikh Khalifa bin Ali Al Khalifa, along with other honored dignitaries, VIP guests, corporate clients, invited guests and members of the media. The celebratory reception was hosted in the Al Rifaa Ballroom. During the course of the evening, IHG and United Hotels Company, the owning company of InterContinental Regency Bahrain, signed a further 10-year extension of the management agreement for the hotel. The agreement was signed by Dr. Omar Al Mardhi, the Chairman and Managing Director of United Hotels Company – and Mr. Pascal Gauvin, IHG’s Chief Operating Officer for India, the Middle East and Africa (IMEA). Currently, the hotel has a total of 321 rooms, with luxurious ballrooms, facilities and restaurants that have hosted various events, as well as local and international conferences. Since the start of its operations in November 1980, InterContinental Regency Bahrain continues to establish itself as the hotel of choice for many travelers; having gained a most trusted and favoured reputation over the past 35 years. The Hotel has succeeded in carving a niche for itself as the business hotel of choice in the kingdom of Bahrain. Over the past three and a half decades, InterContinental Regency Bahrain has hosted key figures and dignitaries in its premises from several countries for various occasions. Having hosted major international conferences and summits, InterContinental Regency Bahrain is a brand known to “Be where the world meets” in bringing together notable representatives from different parts of the world. The InterContinental Regency Bahrain brings alive the rich culture and heritage of different countries, through the authentic experiences that they provide their clients with, in every aspect. InterContinental Regency Bahrain’s efforts have not gone unnoticed as the Hotel boasts many awards to their name, the most recent ones being the Business Traveller Middle East Award for the Best Business Hotel in Bahrain for 2015, and also through the successful training and developing the skills of Bahraini nationals, the InterContinental Regency Bahrain won The Specific Council for Training and Development Bahrainization Award for its Human Resources Department’s distinguished record in this domain. InterContinental Hotels and Resorts are dedicated to superior, understated service and outstanding facilities, with a great focus on the genuine care and comfort showed to their guests. There are over 182 InterContinental Hotels and Resorts around the world with almost 53 hotels in the development pipeline globally.